Last week Bungie held the first in a series of three livestreams which will steadily reveal more about the first upcoming expansion for Destiny 2, the Curse of Osiris. In this livestream Bungie covered the new stories to tell in this expansion, but what exactly did that entail? Let’s take a look to remind ourselves before the next livestream. New stories to tell is intended to cover the new location Guardians will be exploring, the story of the Curse of Osiris, and the characters we’ll meet along the way. The opening cinematic shows Osiris in a bit of a pickle, obviously in the Infinite Forest searching for something. Here he is scared by what he finds and throws his Ghost away through a portal to protect her. From this we can surmise that Guardians will be searching for Osiris in order to help him, and then defend him from whatever is hunting him. At the point Osiris freezes time in the cinematic the Vex actually manage to unfreeze and attack him, so what is that all about and why are the Vex so vehemently searching for one outcome from the future in the Infinite Forest? We’re told that the Vex are amassing on Mercury because the Traveller‘s Light awoke a portal on it. This is bad and it’s why the Guardians are now investigating it. Next up is Osiris himself, and a bunch of lovely screenshots that I’m sure will feature on the site in the future. This guy is the greatest Warlock to ever have lived, and he was exiled to Mercury by the Vanguard. Osiris took what he had on him to Mercury and since then he’s been modifying his gear and weapons with Vex technology in order to keep one step ahead of them. Now we see Sagira, Osiris’ Ghost who is the first named Ghost in the franchise, as well as the second Ghost to be heard in the series ever. She’s also been stylised to look more Egyptian than other Ghost shells in Destiny 2 and that’s important because it’s the whole theme of Osiris. Ikora Rey will feature heavily in the Curse of Osiris because she’s the one who knew Osiris the best, and she’s the one who sends the Guardians to Mercury. She also needs to explore who she is as the Vanguard leader and how to be better at that in order to lead the Last City forward. Brother Vance is the next subject shown and it’s hinted that while Osiris knows there is a Cult of Osiris who worship him he doesn’t like to think of himself on that level. In Destiny 2 Brother Vance wanted to find the perfect Guardian to bring Osiris back, now he knows Osiris is coming back and he is beyond excited about it. Bungie then move onto locations and Mercury is the focus of it all. The key word they thought of when creating this planet was mystery, and that is going to be the theme throughout this expansion. Whatever we see when we’re exploring the planet will always have more to tell, even when fighting in the Crucible. Before the Vex Mercury was a lush garden world, but then the Vex arrived and hollowed it out into their own machine world. 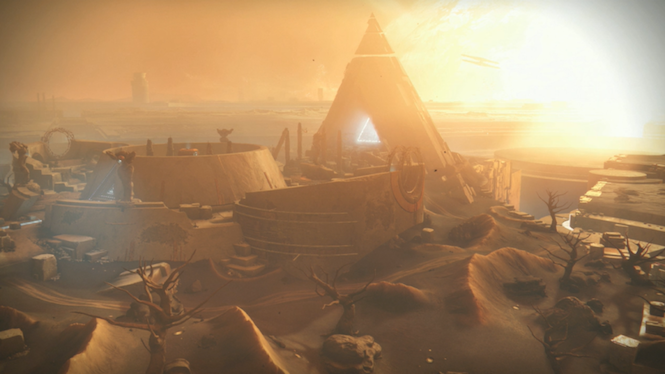 The gate through which players will venture in Curse of Osiris will take them to different versions of Mercury, namely past, present, and future. What the Vex are doing is trying to find the right equation for the future, finding all possible realities until they locate one that they can use to their advantage. Through this gate players will have to face Vex from the future and the present, but also precursor Vex from the long dead past. Due to the theme of the Vex there will be missions in the Curse of Osiris that play out differently each time. Bungie has made different combinations of set pieces that they will implement in different ways each time a mission is loaded in order to make it feel different and unique. This is by no means procedural generation but it does give the impression of it. Future Mercury is next on the screen showing a place called the Dark Future in which the Sun has died, and no life remains but the Vex. This is a terrifying future and obviously one that the Vex would love to achieve. The Lighthouse in particular is a real hellhole, but in the present day it is a social space. Here the Cult of Osiris eagerly await Osiris’ return and have gone ahead and invited everyone there. This will be the start of a number of missions and it’ll be the place where you interact with a bunch of characters. The player level has been raised to 25 and Power Level to 335, but this is not something Bungie go into here. What they do show is some Warlock armour with a Vex helmet that looks seriously creepy. On one of the walls in the Lighthouse there is an in-game tracker for activities after you’ve completed the Cure of Osiris. The activities specifically relate to weapons that you’re able to craft from vex technology just like Osiris. Deej moves onto the surface of Mercury to give us all a taste of the planet. The social space is similar in size to others in Destiny 2 and will feature all the same activities. Apparently there are survivors from the wreck of the Almighty on the planet and that’s who we’ll be facing as we explore. He moves us through the planet which is as you’d expect, but then we hit the Infinite Forest. The Infinite Forest exists within Mercury, the entire centre that the Vex have hollowed out. Here players explore and go through other gates in order to access different realities. The gates are controlled by ‘trees’ which have different appearances for each of the realities. When the updated activity director is opened there is one surprise I wasn’t expecting, The Almighty. Obviously Mercury is a destination but the Almighty is right there, and sadly they don’t go into it. At this point Deej takes the opportunity to address the question of new Raid content coming to Destiny 2. It sounds like there isn’t a new Raid being added but something called a Raid Lair. While the Leviathan is still available the new Lair named Eater of Worlds is now available as a six player activity. This lair features new encounters, puzzles, and bosses, but if you enjoyed the original enough then you’re fine because they’re upping the level requirements to Power Level 300. The idea for a Raid Lair is that it’s shorter and something you can do if you don’t have enough time to take on the entire Raid in an evening. The Raid Lair is set to go below the city on top of the Leviathan, into the belly of this planet eating machine. The devs were keen to tell fans that there are a lot of stories left to tell with the Leviathan so expect more content to come. While it may be that we see more Raid Lairs added to the game I think that’s okay, because it expands the universe and gives us so much more in this rich universe. That was all for this stream but there are two more to come over the next two weeks leading up the launch of the first expansion. Let us know what you think in the comments. Previous articleThe Hero’s Burden Vs Antiope-D Which Is The Better SMG?